Rana Daggubati's Telugu film Nene Raju Nene Mantri has been dubbed in Tamil as Naan Aanaiyittal and will be releasing on the 22nd of September. Interestingly, Yuvan Shankar Raja turns a distributor with this flick. He would be releasing the movie under his banner KYITE Entertainment along with K Productions. 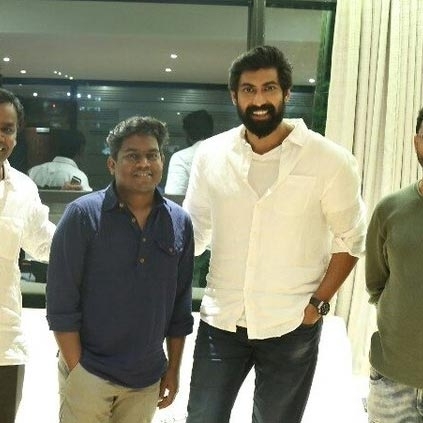 We wish Rana, Yuvan and Naan Aanaiyittal team all the very best! The trailer of Nene Raju Nene Mantri starring Rana Daggubati, Kajal Aggarwal and Catherine Tresa is here. Ram Gopal Varma shares his daughter's workout video and it goes viral! People looking for online information on Nene Raju Nene Mantri will find this news story useful.